Author Anna BeletskayaPosted on January 26, 2016 January 26, 2016 Categories SharePoint Server 2016Leave a comment on What do you need to run SharePoint 2016? Today I would like to share some information regarding the upcoming SharePoint Server 2016. This article describes initial investments made in installation and deployment of SharePoint Server 2016 from Microsoft Ignite in Chicago. Installation with the minimum recommended services. SharePoint Server 2016 is supported on Windows Server 2012 R2 and Windows Server Technical Preview. SharePoint Server 2016 requires SQL Server 2014 for its databases, also it will support SQL Server 2016. 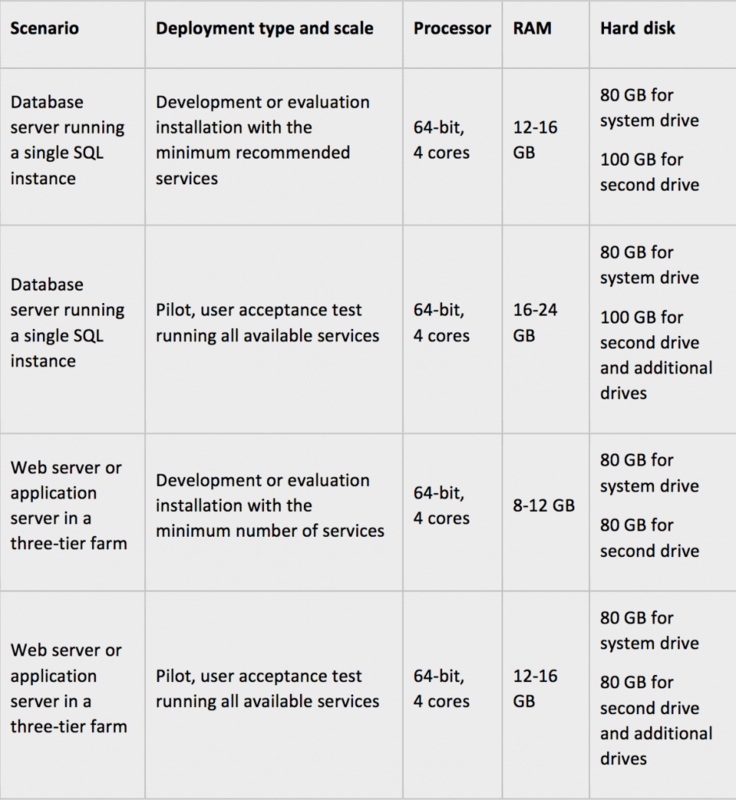 For additional information on SQL Server 2016 see also http://www.microsoft.com/en-us/server-cloud/products/sql-server-2016/. According to Microsoft starting from January 13, 2016, .NET Framework 4.5.2 will be the minimum supported version of .NET Framework 4.x. For SharePoint 16 based on Windows Server 2012 R2 you will need .NET Framework 4.5.2 version. For SharePoint 16 based on Windows Server Technical Preview “Threshold” you will need .NET Framework 4.6 Preview version. This version comes with Windows Server Technical Preview “Threshold”. SharePoint Server 2016 prerequisites are the same as for SharePoint Server 2013. Prerequisites can be installed manually or with the Prerequisite Installer, similar as for SharePoint Server 2013. 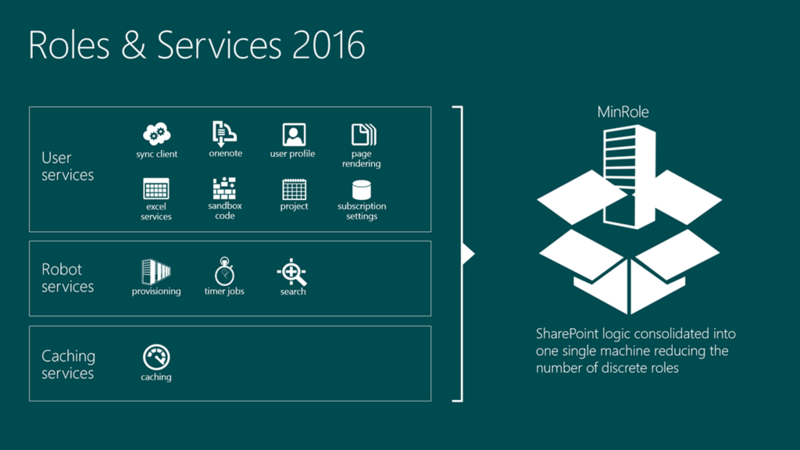 MinRole is one of the new infrastructure advancements in SharePoint Server 2016. MinRole is designed to transform guidance into code, simplifying deployment and scale with SharePoint ensuring a request is served end-to-end by the receiving server based on the origination of the request (I.e. end user or batch processing) and role of the destination server. In previous versions of SharePoint, servers’ role was only defined by what services were provisioned and its placement in a SharePoint Farm topology. MinRole simplifies on-premises server farm deployments, and reduces the unit of scale to simplify capacity planning while providing predictable performance characteristics through enabling selective provisioning of SharePoint server roles based on position and function within a topology. Provisions all services on the server for a single server deployment. This role is provided for evaluation and development purposes. Services the backend jobs or the requests triggered by backend jobs, optimized for high throughput. Services end user requests, optimized for low latency. Services distributed cache for the farm. Optionally, the server assigned to this role can load balance end user requests among the web front ends. Reserved for services to be isolated from other services, I.e. 3rd party, PerformancePoint, etc. Also MinRole adds a new command line parameter, “localserverrole”, that can be used to specify the role that should be assigned to a specific server when configuring SharePoint Products and Technologies. Also MinRole can be instrumented through the PSConfig GUI. SharePoint Server 2016 will support upgrade from SharePoint Server 2013. To upgrade from SharePoint Server 2013 to SharePoint Server 2016, you can use the database-attach method to upgrade. As for site collections provisioned in backward compatible SharePoint 2010 (14) mode, they must be upgraded to 2013 prior to upgrading to SharePoint Server 2016.